In my quest, like many parents, to keep my children interested in that thing called eating I have tried on occasion to form food in fun ways. Astronaut carrots, deforested broccoli, you know the usual. Devil, but it didn’t look devilsh enough, so I thought I would try the crazy anti semite leader of Iran Ahmandad..whatever and add coffee grounds for his permanent sort of beard. This was not my finest. By the way, Rex picked up the gun sandwich and the barrel went limp. “Momma, it broke.” Yeah, there is a reason sandwiches are NOT shaped like that. What kind of sandwiches do you make your kids? My standard answer is “if I am at his restaurant he does.” Even when Mark is home at night ( at most two nights a week) I am the executive chef and he is my sou chef. I tell him what we have and what I was thinking, then he takes and comes up with something. Is that something that would be featured on a special tasting menu at Campanile? Not usually. The kind of food a great restaurant makes is a little too involved for a family of five when small kids and one grown lady will get really cranky if they don’t eat on time. Also, I have to remind Chef Peel about what the kids will really eat. I use to say, “okay, we have sausages, broccoli, grape tomatoes and various pasta.” Mark would cook it all, and spice it well, then he would put it ALL TOGETHER. For a my little kids that was a big yuck. I will never be a chef like my husband. Not even close. But, I have realized I am a diner cook. If you walked into a NY diner and looked at the menu, that’s the kind of stuff I can do pretty well. Chicken Milanese, fettucine alfredo. My vegis are way better than a diner, though. When I want exciting food, I can go out. Several weeks and our team and Roy’s great team meeting and such and an exciting night is born. 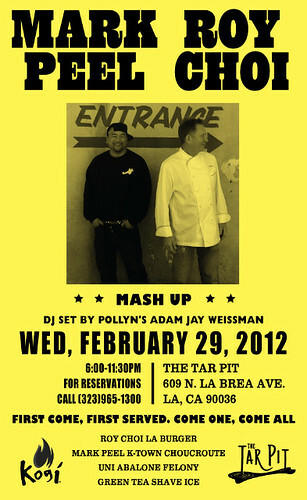 Here is the flyer the Kogi gang put together that I love.